The issue of racism still occurs in this year of 2012. To kill a black teenage boy because he’s wearing a hoodie and is walking down the street talking on his cell phone is racist. Trayvon Martin was found dead laying face down in the grass with a fatal bullet wound to the chest. It is pretty obvious that George Zimmerman had something to do with the death of the young boy. He was standing near the boy with blood on his face and the back of his head and grass stains on his back—which means something had to happen. It was stated in the article, “The Curious Case of Trayvon Martin”, The New York Times, by Charles, M. Blow, March 16, 2012, that Zimmerman was the one yelling out for help. I honestly think that the little boy would’ve been the one yelling out for help to save his life. I don’t think that a little boy could do that much damage to a grown man to the point where he (the grown man) had to kill him in self-defense. I don’t think that the police handled this situation the right way. I believe that with the evidence given, Zimmerman should be incarcerated for murder. Say something like this happened in the District of Columbia or in Prince George’s County; the person in Zimmerman’s shoes would have been charged with murder automatically. Just because Zimmerman was the neighborhood watch captain doesn’t mean they should show him any mercy. A set of parents just lost their son because Zimmerman was suspicious about the way Trayvon looked. Just because he was a black young man walking down the street with a hoodie talking on his cellular device doesn’t mean he’s up to something. If he looked “real suspicious”, as the article says, Zimmerman should have taken precautions to keep an eye on the boy until the proper authorities got there. He shouldn’t have just taken on the job of another person. If he hadn’t got out of his car to approach Trayvon, things wouldn’t have happened as they did. He should have just let the little boy go on about his business. The traces of marijuana found in Trayvon’s backpack had nothing to do with him being dangerous. It is unfair that he’s dead and there’s no justice being done to Zimmerman. He’s living a free life like he never did anything. I believe that because he’s white and was the neighborhood watch captain they spared him mercy and won’t do anything to him. Maybe Zimmerman stated that he was the one yelling for help so that he could make it seem like he didn’t do anything. I believe that investigators should have looked into the situation more and questioned more people. They should have done more research on what happened. 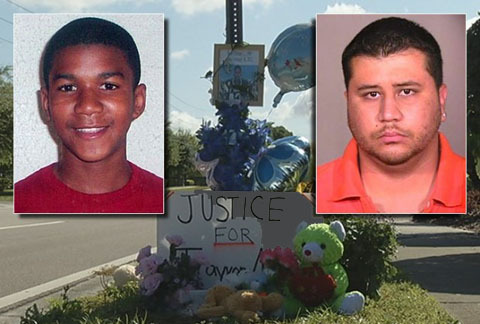 Zimmerman killed one innocent black boy and got away with it—meaning it could happen again. We can never know what’s on the minds of people like this. Authorities need to put someone else in Zimmerman’s place as neighborhood watch captain to prevent any future mishappenings. What do you think. You can leave a comment in the box below. Aierial James is a senior at Anacostia High School.